This was a cute and clever quick little read. I'd place this somewhere between A Series of Unfortunate Events (which I certainly liked) and The Name of this Book is Secret by Pseudonymous Bosch (which I distinctly did not). It's not surprising then that this book fell somewhere in between as far as my enjoying it. One thing that this book has going for it, above and beyond its story is the actual look of the book. 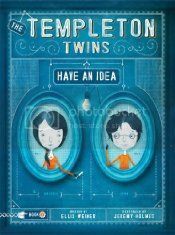 Everything in the book is printed in a blue tone, almost giving the book the feeling of blueprints, which is apropos given the Twins' father is an inventor of some renown and the Twins like to pride themselves of coming up with ideas of their own. When their father is accused of stealing an idea that is used in his latest invention, the Twins find themselves in some very precarious predicaments (hence the Unfortunate Events vibe) and then they go on an adventure to try to prove their father's innocence (where Pseudonymous Bosch vibe comes from - the adventure part, not the trying to prove their father's innocence part). Needless to say, precarious predicaments that the Twins find themselves in are wildly unbelievable and the adventures are fun, but for me at least, the book just lacked a certain something. Of course, there's also the fact that I'm not the target age for this particular book, but I do think my younger self would have loved this book. The adult me can appreciate the work that is put into the overall packaging though, since the book is quite nicely presented. Let your younger ones have a go at this, as I think it will appeal to them immensely.